Honda 01-05 Civic 1.7L Automatic Trans. 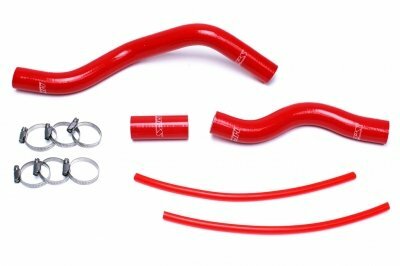 HPS High Temp 3-ply Reinforced Silicone Radiator Hose Kit Red is designed to replace stock OEM rubber hoses which can eventually weaken over time, leading to premature failure. With premium quality silicone and race inspired design, this HPS silicon radiator hose kit can withstand the harsh high temperature and high pressure operating conditions of the engine yet still maintaining peak efficiency during competition or daily driving. HPS silicone radiator hose kit has all the correct bends and curves for a perfect fit replacement for your OEM rubber coolant hoses, compare to the universal hoses you can get from the local auto store, HPS hose kit is much easier to work with. Max. Temperature Rating: 350 deg. F. 100% Stainless Steel Clamps are included for easy installation. This product fits Honda 2001-2005 Civic 1.7L Automatic Trans.